I didn’t receive much relief from the heat, walking a thousand feet above the valley floor, but the light breeze blowing the sweat from my shoulders and arms cooled me to some degree. Shade would have been nice, but it wasn’t a good spot for that. The vegetation in all directions was best described as low and shrubby. The mountain maples, stunted by the hard, dry and rocky soil, had only recently begun leafing, so they were small, bright green and—because of their lack of height and sparse canopy—not very adept at throwing shade. Wild hopes of spotting a final beautiful yellow glacier lily drew me up the hillside. A month earlier, while the snows still fell and melted in a single day, I had spotted them spread across the lower hills of Emigration Canyon. I suspected that this rare early-spring flower would likely be gone by the close of May, but I needed to make sure. I took my car up to the saddle at the head of Emigration, just before the road dips off into East Canyon. There is no exact trail here, but sometimes that makes a quick jaunt through the sage all the more adventurous feeling. I knew right away that the lily I came looking for would not be found. Across the hill, a new yellow spread its joy and announced the end of the glacier lily’s season: the bright sunflower heads of arrowleaf balsamroot, my steady companion. As a young trail worker for the U.S. Forest Service, fresh out of college and still eager to learn everything I could, I carried with me everywhere I hiked a copy of Wildflowers of Wyoming, a plant-identification book by Diantha and Jack States. 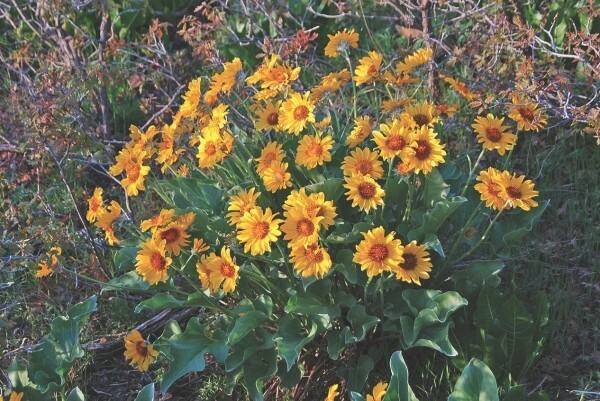 All across the slopes of western Wyoming that first spring, little yellow sunflower-like blooms greeted me from inside a nest of bushy gray-green leaves. Searching the pages for its name, I found my answer among the Asteraceae family, commonly known as the aster or sunflower family. They were the arrowleaf balsamroot. Native Americans, the States’ description told me, once ate the plant. The young green stems and leaves were consumed raw like celery and lettuce. The roots were roasted or slow boiled before eating, processes that made them taste sweet. All that summer, I studied my flowers. It felt as important as my job clearing trails. When I passed a flower, I didn’t want to simply marvel at its blue-to-magenta hues; I wanted to know it by name as smooth beardtongue penstemon. I wanted to cross a mountain stream and know before looking that I would find brook saxifrage and Lewis’ monkeyflower, the latter named for Meriwether Lewis of the Lewis and Clark expedition. These investigations brought me closer to the forest. They attuned me to the change of seasons according to nature, not a calendar. They made me a local, speaking the dialect of flowers, shrubs and trees. Moving from one western state to another with my Forest Service job, I always found the arrowleaf balsamroot. There it would be, announcing the end of spring and the beginning of summer. Even here, at the top of Emigration Canyon, arrowleaf balsamroot emerges from under the broken and crumbling slabs of white limestone that cover the ground. But something else was growing here, too, something similar but not the same. Crowned with the same yellow blooms, this plant looked as if someone had taken scissors to it, fraying the leaves into fernlike palms of green. Though it was vaguely familiar, I couldn’t find the plant in my identification book. Tentatively, I noted cutleaf balsamroot in the book’s margin followed by a large question mark. Back at home, an Internet search confirmed the name cutleaf balsamroot—a rare flower found mostly in the mountains along the Wasatch Front. It was a close cousin of my old friend, and a treat as special as the glacier lily.